Enroll in the PINNACLE Registry and Diabetes Collaborative Registry or get more information. The PINNACLE Registry and the Diabetes Collaborative Registry are approved by the Centers for Medicare and Medicaid Services (CMS) as one Qualified Clinical Data Registry (QCDR) for the 2019 Merit-based Incentive Payment System (MIPS) Program Year. As a QCDR, the PINNACLE Registry and the Diabetes Collaborative Registry offer an easy solution for practices to report MIPS for the 2019 program year. Reporting MIPS data to CMS is a FREE benefit to practices currently submitting data through the registries with the benefit of interoperability with most electronic health record (EHR) systems. Practices that are not currently enrolled can click here to join. Measures indicated as available for public reporting are required to meet certain standards set by CMS. These measures must be statistically valid, reliable, accurate, comparable across submission mechanisms and meet the minimum reliability threshold to be included in the Physician Compare Downloadable Database. The measures are posted publicly in plain language, making them easier to understand. First-year measures are not available for public reporting. Click here to view the ACC Outpatient Registries MIPS Measures. Click here to view the ACC Outpatient Registries QCDR Measures Specifications. The 2019 MIPS performance year started Jan. 1, 2019, and ends on Dec. 31, 2019. Eligible clinicians are required to submit a full year of data on Quality measures and at minimum 90 days of continuous data for Promoting Interoperability and Improvement Activities. Health care providers will begin to receive payment adjustments in the form of incentives or penalties in 2021 for the 2019 MIPS program year. Not participating in MIPS in 2019 will result in an automatic payment adjustment of negative 7 percent in 2021. Providers are responsible for reporting six measures, including one outcome measure or high-priority measure if outcome measure is not available. All eligible providers will be required to report a full year of data for Quality in 2019. CMS will automatically calculate the performance score for Cost based on Medicare claims data. There is no additional work required from eligible clinicians. Click here to view the QPP Year Two Program change highlights. Reporting through the PINNACLE Registry and the Diabetes Collaborative Registry for the 2018 MIPS Program year is closed. The ACC successfully submitted MIPS performance data on behalf of nearly 1,500 clinicians for 2018, including 81 group practices. In 2018, clinicians could select from 16 quality measures, including several outcome and high-priority measures, covering four National Quality Strategy domains: Effective Clinical Care, Communication and Care-Coordination, Community and Population Health and Patient Safety. Clinicians could also select from all CMS-approved Promoting Interoperability measures and Improvement Activities. 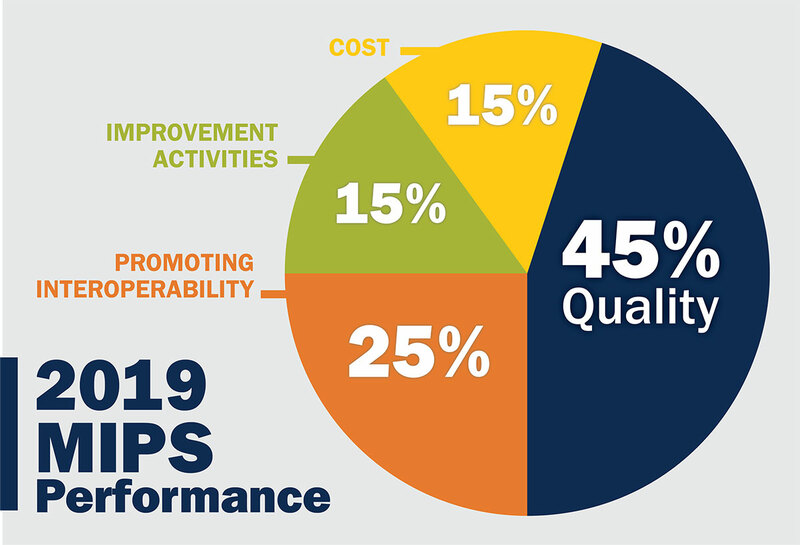 CMS will review and calculate final performance scores by July 1, 2019, to determine whether clinicians and groups satisfactorily met the 2018 MIPS requirements. The data submitted in 2018 will be used to calculate the payment adjustment applied to 2020 Medicare Part B payments. If you opted to report through the PINNACLE and/or Diabetes Collaborative Registries, we will communicate updates through the Outpatient Registries Newsletter and other email communications. If you have any questions on your submission, please email ncdr@acc.org. Create an Enterprise Identify Management (EIDM) to access your 2018 MIPS Performance Score and Quality Resource Use Report (QRUR). Find out if your practice has a dedicated Quality Improvement team by asking your practice administrator if your practice is a part of an Alternative Payment Model (APM) or Accountable Care Organization (ACO). For questions about the Outpatient Registries and MIPS participation, contact the Registry Support Team at 1-800-257-4737 or ncdr@acc.org. For inquiries about MIPS and related topics, such as reporting requirements, negative payment adjustments, QRUR and Individuals Authorized Access to the CMS Enterprise Identity Management system (EIDM) registration – please visit the CMS QualityNet Help Desk website, or reach out by phone at 1-866-288-8912, Monday through Friday from 7 a.m. to 7 p.m. CT, or by email at Qnetsupport@hcqis.org. Sign up for the ACC Advocate Newsletter. Opt in or out of ACC newsletters by logging into ACC.org and selecting My Communications Preferences under the My ACC tab. If you have questions about the Outpatient Registries and participating in MIPS, contact the Registry Support Team at (800) 257-4737 or ncdr@acc.org. For more information about MIPS and how to get started please visit CMS.gov. If you have an inquiry regarding the reporting requirements, negative payment adjustments, feedback reports, and Individuals Authorized Access to the CMS Enterprise Identity Management system (EIDM) registration, please call the QualityNet HelpDesk. Available Monday - Friday 7:00 a.m. - 7:00 p.m. Central Time (CT) by phone 1-866-288-8912, or email at Qnetsupport@hcqis.org. You can also access our frequently asked questions for the outpatient registries.